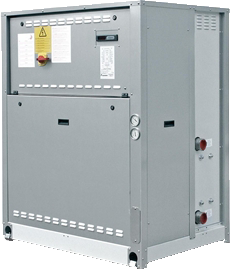 Indoor unit for the production of chilled water that may be connected to a remote condenser with hermetic rotary scroll compressors working with R410A, braze-welded plate-type exchanger and thermal expansion valve. Panels and base in hot-dip galvanised sheet steel with paint finish. W3000SE Compact: electronic controller complete with keypad features an easy-to-use interface and a complete LCD display, allowing to consult and intervene on the unit by means of a multi-language menu, with selectable language setting on site. This controller also includes an internal clock. All the W3000 electronic controllers offer advanced functions and algorithms. The keypad features an easy-to-use interface and a complete LCD display, allowing to consult and intervene on the unit by means of a multi-level menu, with selectable language setting. The regulation is based on the exclusive QuickMind algorithm, including self-adaptive control logics, beneficial in low water content systems. As alternatives the proportional- or proportional- integral regulations are also available. The diagnostics includes a complete alarm management, with the “black-box” and alarm logging functions for enhanced analysis of the unit operation (available on W3000SE Compact only). For multiple units’ systems, the regulation of the resources, via optional proprietary devices, can be implemented. Energy metering, for both consumption and capacity, can also be developed. Supervision can be easily developed via proprietary devices or the integration in third party systems by means of the most common protocols as ModBus, Bacnet, Bacnet-over-IP, Echelon LonWorks. Compatibility with the remote keyboard managing up to 10 units. The internal real time clock allows to manage a weekly schedule operating on 4-day profiles with 10 hour belts (available on W3000SE Compact only, optional on W3000 Base controller). The defrost adopts a proprietary self-adaptive logic, which features the monitoring of numerous operational parameters. The condenserless unit comes complete with built-in microprocessor control with possible connection to the condenser. The built-in hydronic module already contains the main water circuit components; it is available with single or double pump configuration, with low or high head. Acoustical enclosure to reduce the noise emissions.